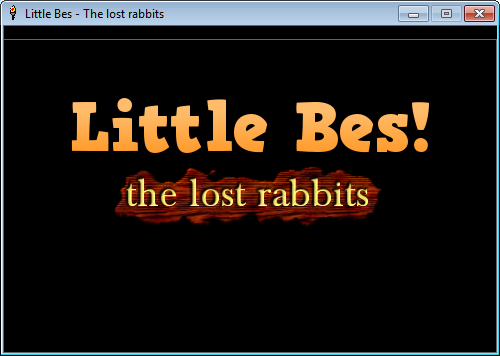 Update: You can now download the executable file to play this game without needing to install Liberty Basic on your system. I have always wanted to make a small old-school platform game like the ones I used to play several years ago. It will only take a fairly simple game engine and the game graphics. There are countless game engines today out there that I could download and use to make the game. Since I was mainly curious about the game engine and how it actually works I decided to built the whole game including the game engine from scratch. I have been using Liberty BASIC in the past for various small projects, like the USB Thermometer, and I always liked the simple and easy structure of the BASIC language variant. I also like the fact that it runs fine under wine, accessing files and serial ports, so I'm able to use it and develop with it while using a Linux PC. Liberty BASIC is not free software but you can download it (it's about ~3MB), use the software and evaluate it until you decide that it fits your needs and pay for it. The aim of the game is to try and collect as much as possible rabbits. 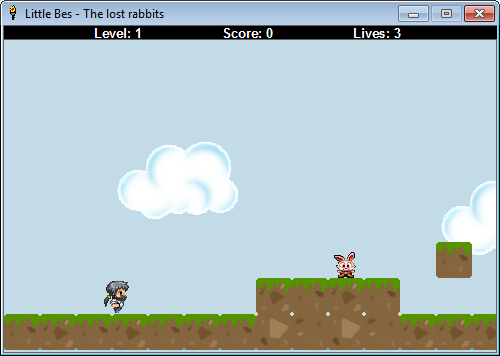 The game has 10 levels that you need to go through and collect those rabbits. For this game I have used the free tiles provided by Indie Game Designer (link). As for the game engine I had to do a bit reading online on various sites describing how a scrolling game engine actually works. I tried to keep the code clean and well documented in case you are interested to see how the game engine works and make your changes, like adding enemies. Note: The game is released under the GPL v3 license.